The Daily Bite and is it a Lapse, Relapse or Collapse? 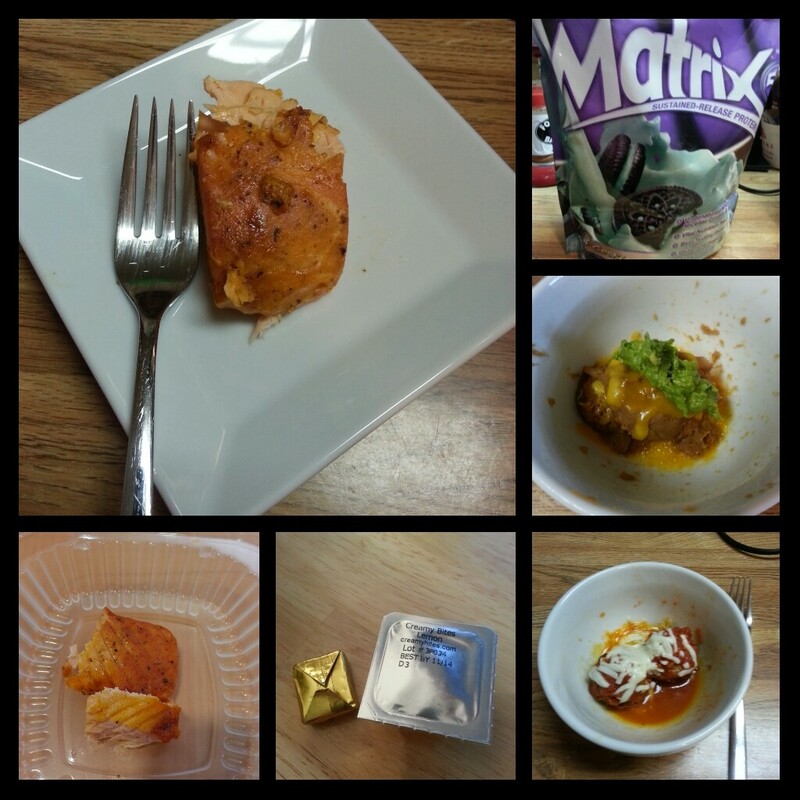 Today’s food choices, clockwise from upper right: Syntrax Matrix 5.0 Mint Cookie Protein Powder; 1/4 cup fat free refried beans with 1 teaspoon cheddar cheese and 1 teaspoon guacamole; turkey meatballs in marinara with mozzarella; multivitamin and calcium supplement; 2 ounces of Cajun baked salmon. I learned my lesson about capacity yesterday and decided to pay closer attention to what my stomach was telling me about its level of fullness. I was much more successful at figuring out when I’d had enough today than I was yesterday…I will eventually get the hang of this! As I’m working my way through the soft foods stage, I’m learning which foods I can and cannot tolerate, so this is why you are seeing a lot of repeat performances in terms of meals. Today I introduced two new foods I hadn’t yet tried: refried beans (one of my favorite things) and salmon. Both went down and stayed down with no issues, so these are things I will continue to eat. The refried beans were a snack today and were quite tasty and simple to prepare. I had a can of fat free refried beans in the pantry and the remainder of the guacamole I’d bought from Chipotle so I thought the combination might be a good snack and a good way to get in at least a little fiber. So I measured out 1/4 cup of beans into a bowl, and heated it up with a teaspoon of sharp cheddar cheese until the beans were warmed through and the cheese melted, about 30 seconds. Then I topped it with a teaspoon of the guacamole and voila! A vegetarian snack that had 5 grams of protein, 2 grams of fat, 11 grams of carbs (4 of which are dietary fiber) and was filling. I also wanted the fiber in the beans as I’m trying to avoid constipation and the need for a laxative agent. I never had problems going before, and I don’t want them to start now that I’m not consuming veggies on the regular (for now). I really want to incorporate more veggies but it’s tough when protein is your priority and you’re trying to keep your carbs low. What happens when we fail at what we set out to do? How do we handle failure, and how do we cope with being less than perfect? No one among us is perfect, no matter how hard we try to be. The process of weight loss is especially fraught with multiple opportunities for failure. Now don’t get me wrong–I’m not saying that any time you set out to lose weight you are automatically being set up for failure, I’m saying there are as many opportunities to fail as there are to succeed. Many of those opportunities for failure revolve around how to handle the times when we are faced with a situation that could potentially derail whatever progress we’ve made. It’s at that point where we have to determine if we’ve lapsed, relapsed or collapsed along our path to better health. Tonight in our group meeting we discussed what the differences in these three things were, and how we could manage what our therapist, Dr. A., referred to as “high risk situations”–situations that could set us up for failure–should one of these things occur. A lapse is something everyone experiences, because it is a slip, something temporary. It might happen once or twice but you’re able to get back on track with whatever you’ve slipped about. A relapse is several lapses, and has you returning to behaviors that aren’t helping you achieve the health you’re after. At this point you’ve given up employing the behaviors that made you successful–mindfully eating, tracking, planning, managing your environment. Relapses can lead to collapses–you’ve abandoned your healthy lifestyle entirely, you’re not trying to manage your weight or any other aspect of your health and you’re simply not even trying. You’ve thrown in the towel at the point of collapse. I have experienced all three of those at one time or another with regard to my weight management (or lack thereof). It was the latest collapse (last fall) that led me to decide that surgical intervention was needed for me to have a shot at finally getting healthy. The lapses that led to relapses during my last major weight loss effort snowballed into a collapse that got me where I was at the end of the school year at nearly 400 pounds (for the 3rd time in my life). I think that’s how it happens–lapses sort of accumulate moss like a rolling stone and turn into a collapse along the way. Mindful eating: Trying to eat in a distraction-free environment. Taking small bites with 20-30 chews so that I can fully taste what I’m eating. Smelling my food before putting it in my mouth. Closely examining what I am about to eat. Trying to enjoy the texture of what I am eating. Managing your environment: Getting rid of trigger foods in the house. Not putting myself in situations where trigger foods are readily available. Getting rid of starchy carbs in the pantry/refrigerator. Eating in a quiet location at home. Shifting activities with friends to activities that do not require food to be present to enjoy being with them. Planning for meals and physical activity: Cooking and freezing foods ahead of time so there is no reason not to have something already prepared. Making a menu for the week and sticking to it. Carving time out of the day for at least 20 minutes of physical activity (now, this will increase as time goes on and I am cleared for full activity). Positive thinking: Telling myself that I can do this. Telling myself that even though the number on the scale does not change, I am still successful because my clothes fit better and I can move easier. Setting realistic goals and expectations for myself. Not beating myself up when a lapse happens. Identifying barriers to success: Fatigue at the end of the day can prevent me from getting to the gym or preparing something healthy to eat. Behavioral fatigue may set in but I think proper planning may help head this off. I need to manage my time better so I can get an adequate amount of exercise daily–perhaps build it into my school day and just keep moving. The lapses we experience help us to understand how important these skills are to us, and teach us that these skills are ones we’ll need to use for the rest of our lives if we expect to be successful in our weight loss effort. Lapses are opportunities for learning–learning to be gentle with ourselves when we do slip, so that the next time a lapse happens, we don’t fall. How do you handle lapses? How do you prevent them from becoming relapses, and then collapses? This entry was posted in daily bites, head trips, oh behave!, post-op, vsg, weight loss surgery and tagged choices, daily bites, habits of mind, oh behave!, post-op eating, post-op life, she's got skillz, tiny plates, VSG, vsg realness, WLS, work that head game. Bookmark the permalink. Thank You. When did you have your surgery? Which one? I had a sleeve gastrectomy on July 8. Congratulations! I am coming up soon!! Thanks! When is your date? I have a plaque with Mary Anne Radmacher’s words: “Courage doesn’t always roar. Sometimes courage is the quiet voice at the end of the day saying, ‘I will try again tomorrow.’ ” It hangs in my bedroom where I can see it before I go to sleep and when I wake up. It’s helped stop many lapses from growing into relapses. I like that. A lot. I will have to remember that one during the times when this seems unbearably tough.